BAGHDAD: Results from Iraq’s Kurdish election on Sunday are expected to bolster the plans of veteran statesman Massoud Barzani to sweep aside his main rival just days before a push to secure the presidency in Baghdad for his party. 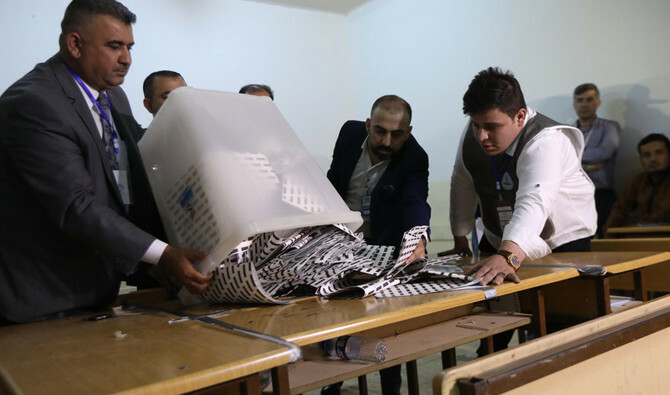 Voters chose from more than 700 candidates to win 111 seats in autonomous Kurdistan’s Parliament, a year after a failed independence referendum to separate from Iraq. Ever since, Kurdish parties have been deeply divided inside and outside the region. Irbil, the capital of Kurdistan, insisted on conducting the referendum amid the turmoil of Daesh’s demise in the country and despite widespread international and local objections. The relationship between the two biggest and most powerful Kurdish parties, Barzani’s Kurdistan Democratic Party (KDP) and the Patriotic Union of Kurdistan (PUK), was severely damaged. The referendum led to the Iraqi government imposing administrative and financial sanctions on the region to force the Kurdish Regional government to abandon its results. Baghdad launched a military offensive to retake control of disputed areas from Kurdish forces, including the oil hub Kirkuk. KDP leaders accused the PUK of betrayal by abandoning independence efforts after the referendum and siding with Baghdad. They said the PUK’s aim was to thwart KDP efforts to dominate Kurdish politics inside the KRG and in Baghdad. The party refused to fight the Iraqi security forces as they retook Kirkuk and the other disputed areas located outside the constitutional border of the Kurdistan region. 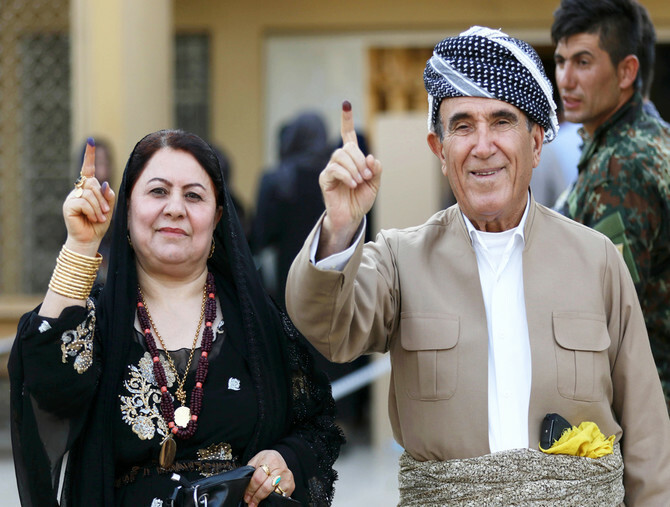 The regional elections were limited to the four provinces of Irbil, Dohouk, Sulaimaniya and Halabja. Polling closed at 6 p.m. local time and it is not clear when results will be announced. Parties said the turnout was expected to be around 40 percent. No security problems were reported. Initial signs indicate that the KDP is likely to win the majority of votes after the decline in influence of the PUK. The party had previously received a third of its votes from Kirkuk and the disputed, which were not included in voting this time. Ghoran, the third biggest Kurdish party, has also lost much of its strength over the past two years due to the death of its founder, Nushirwan Mustafa, and the dissension of many of its leaders. The party is not expected to win enough seats to play a key role in the regional parliament. The small Islamic Kurdish parties and minorities will have little impact unless they join forces with one of the three main parties. “Despite all the tremors that the KDP suffered after the referendum, it is still the only party that has maintained the same areas of influence and the same public support,” Yassir Emad, a local Kurdish journalist told Arab News. The election will determine which party will have the final word in the next regional government. The KDP, which has adopted radical policies on Kurdish independence, has led most of Kurdistan’s governments since it was declared an internationally protected zone in 1992. But the new government may contribute to resolving the outstanding problems with Baghdad. During campaigning, the KDP’s leaders said they were seeking to achieve a strong majority in the regional Parliament. The KDP and PUK have been controlling the Kurds’ share of federal positions in Baghdad since 2003. Under a 2005 gentlemen’s agreement between Iraq’s political forces, the position of president is among the posts held by the Kurds. The candidate of the PUK has held the office for the last three governments in exchange for the regional president post among others, which were filled by the KDP. Both parties are used to resolving their differences in Kurdistan and negotiating with their Shiite and Sunni rivals in Baghdad as a united front, but the situation has completely changed this time as Iraq struggles to build its next government after May elections. The PUK nominated Barham Salih, the veteran politician, to be their candidate for president. The KDP, however, nominated Fuad Hussein, Barzani’s secretary, for the same post. The Shiite Reform alliance, sponsored by Muqtada Al-Sadr, and the rival Iran-backed alliance, Al-Binna’a are the only parties that can provide the 210 votes required to win the post. Both alliances asked the Kurds to agree on one candidate before going to parliament to avoid the dispersion pf MP’s votes and the rise of a candidate that has not been agreed upon. Barzani, who gave up his post as head of the Kurdish region last year after the failed referendum, insisted on refusing to elect the president in Baghdad before knowing the results of the regional election, Shiite and Kurdish negotiators told Arab News. Barzani and KDP leaders have said the post belongs to the Kurds, and whoever represents the Kurdish majority, should be rewarded with the position. “This post is for all the people of Kurdistan… and the candidate for the president (post) must represent the majority of the people of Kurdistan,” Masrour Barzani, Massoud’s son and adviser of the Kurdistan Region Security Council, said on Sunday. Massoud Barzani’s insistence on the post of president for his party and rejection of all other PUK questions, has raised questions about the KDP’s goal, especially as the president has no executive powers and his post is largely ceremonial. “Barzani is looking to crash his Kurdish rivals inside and outside the region, so he is just pressuring the PUK, his biggest rival by using the post (of president) as a tool,” Abdulwahid Tuama, a political analyst, told Arab News. “The post of president represents the last lifeline of the PUK to continue as a key player in Baghdad and a balancing factor for the forces in Kurdistan. The best of two worlds: actual autonomy and big influence in Baghdad.